This week I went to the European Foundations Conference held in Cascais near Lisbon. This gave me my first ever opportunity to visit a casino. The juxtaposition of sober grant-making bodies and the free-wheeling of wheel and dice was an interesting one (perhaps a side opportunity to make up on declining portfolios after the financial crisis)! But I think conditioned by the need to find an alternate space (to the hotel) that could house 600+ for dinner and entertain them. 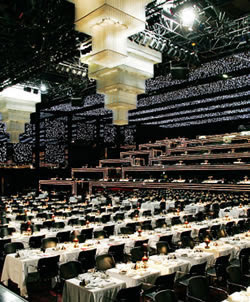 The restaurant glittered starry in black and white with ranks of tables ascending away from the stage and into 'space' was, I think, the effect looked for. The food was surprisingly good given its mass production. This was followed by a stage show: the History of Fado, designed by an apparently famous theatre director/producer which I can safely say astonished its audience. It was if Portugal's ancient and distinguished folk tradition had decided to compete in Eurovision: high camp and florid 'acting' swept through the music that itself was amplified to the verge of recognition as fado. 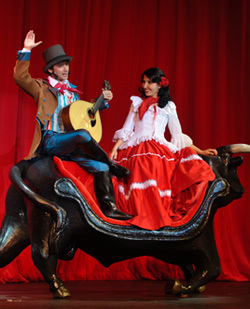 No one who was there will ever forget it - my favourite was the man in sixteenth century dress, platform boots with a whip and these two characters who were whisked around the stage, serenading on a bull! What I noticed most from sitting near the stage was the poor production values - what might have looked glamorous from 'out of space' (at the back) looked distinctly threadbare at the front: costumes especially sadly. Meanwhile one episode, when the Lisbon court took exile in Brazil, positively offended the Brazilians present at the depiction (too light hearted) of their colonization! I enjoyed in that way that terribly bad things can be! It contrasted vividly with my previous visit to Lisbon when I had sat in a smoky cellar listening to a woman and her accompanying guitarist sing one hauntingly lament toned piece after another, immersed in the melancholies of (fado) fate filled lives. I managed my first visit to a casino without gambling (no time) and only a glanced glimpse at rows of waiting slot machines, no tables visible, nor indeed elegant Bond-like beings! I think more Vegas than Monaco. Portugal, in spite of being on its uppers, was its eccentric self: relaxed, friendly and often quietly charming. The architecture in Cascais is eclectic - the old, tiled, quirky jostling with the modern, sharp, often disconcerting. The building next to the conference hotel - made as if from giant container boxes - was stunningly out of place and ugly. But the whole seems to work together. It was lovely to sit in the small squares and watch life flow by into the early hours, exchanging earnest conversation about saving the world or given foundation clout, nudging it, occasionally, in the right direction!